If you’ve recently had a baby, or have a toddler, you know they can be expensive. One of the most costly but necessary items is diapers. If you have multiple children in diapers, that can significantly increase the amount you spend. Many don’t realize there are ways to get free diapers to help ease the budgetary impact of having a little one. How much does the average family spend on diapers each year? Studies show the average family spends $1,000 per year on diapers per child. This can strain an already tight budget. Thankfully, there are resources to get free baby diapers and save money for other items of need. 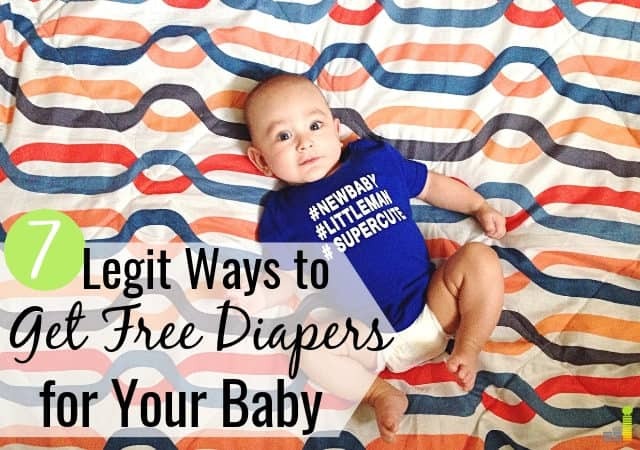 There are a number of ways to get free diapers. For instance, organizations in your area often provide ways to get free baby stuff, including diapers. There are also national organizations that offer resources to get discounted baby items. You can also find ways to make money on the side to help supplement the cost of buying diapers. 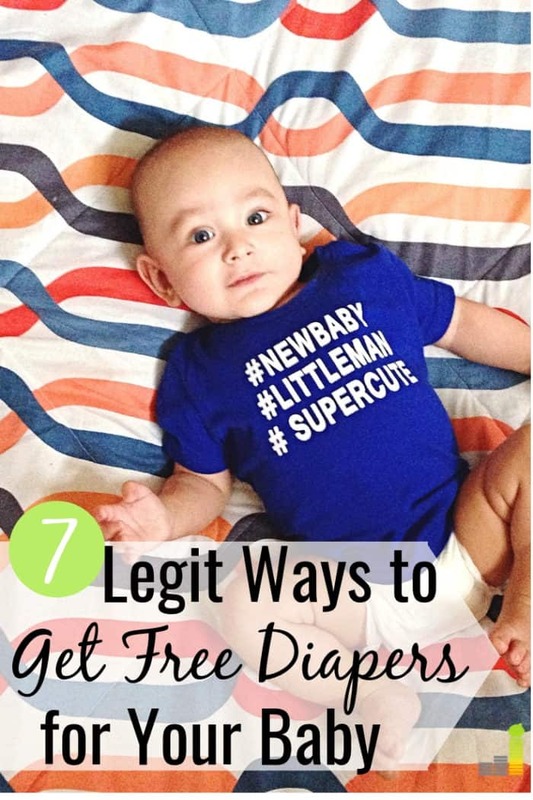 If you want to know how to get free diapers and wipes, here are seven resources to help with costs. If you are expecting and want to stock up on diapers, that’s a wise decision. One thing you can do is create a baby registry at Target. One of the main perks of creating a registry is the free Target samples you receive. When you set up your registry, Target will give you a gift bag with $100 worth of free products and coupons. You also get a 15 percent discount on any items that are left on your registry eight weeks before your baby is due. Be sure to add diapers to the list so people can purchase some for you. You may also want to put several different sizes of diapers on your list. Doing this allows you to have a stockpile so you won’t have to purchase the next sizes immediately. If you’re looking to get free baby diapers, you can try take online surveys to earn extra cash. Many of the best paid survey sites let you redeem points for cash, or you can use them to earn free gift cards. You can use gift cards you earn to get free diapers and wipes, reducing the amount you have to spend out of pocket. Survey Junkie: Survey Junkie is one of the best survey sites to make money because it’s so simple to use. Survey Junkie is one of the oldest survey sites, starting in 2005, and boasts over three million members. It’s pretty easy to start earning money with Survey Junkie. You just open an account, fill out a quick profile, and start taking surveys. You can start redeeming points once you hit the 1,000 point mark, which is equivalent to $10. Survey Junkie lets you take surveys on your smartphone or desktop. Check out our Survey Junkie review to read more about how the platform works. Pinecone Research: Pinecone Research is one of the highest paid survey sites around. They pay $3 per completed survey and they also pay you $3 when you sign up. Pinecone specializes in product testing over straight surveys since they want to test products before they make it to the public. Like other survey sites, you can redeem points for cash or e-gift cards, and every 100 points equals $1. Our favorite part of Pinecone Research is that they have no minimum redemption amount, so you can start redeeming after your first completed survey. Ipsos i-Say: Ipsos i-Say is one of the oldest online survey sites in the niche. The company started in 1975 and specializes in political-based surveys, but they offer many other surveys as well. What we love about Ipsos i-Say is their low minimum redemption amount. You can start redeeming rewards once you hit 500 points, which equals $5, and you can redeem points for cash or for e-gift cards delivered instantly. You also earn loyalty points for each survey you complete and are entered into drawings they offer for bonus points or other awards. Major diaper brands are always giving out free baby diapers and other products. The key is to register online to receive their samples and be the first to hear about their offers. Brands like Huggies, Pampers, and Luvs all offer rewards programs, free samples, and discounts. Each program varies on what they offer. Pampers is one of the best-known diaper companies. They offer a rewards program to get discounts and free Pampers diapers. This is primarily done by downloading their app. On the app, they provide a number of ways to earn free credits you can use for discounts and free diapers. Be aware, however, that the most common way to earn points is by purchasing Pampers diapers. You scan each UPC code with your phone, allowing you to earn points. The Huggies diaper program is a bit more robust than the Pampers program. Like Pampers, Huggies has an app that you can use to earn points. Also like Pampers, you earn points by making purchases. However, the earnings potential doesn’t stop there. You can also earn points by taking surveys on the app, sharing items on social media, and entering sweepstakes. The points can be redeemed for gift cards you can use to buy free diapers. Unfortunately, Luvs does not have a rewards programs like Huggies or Pampers. They do offer coupons on their website to get discounts on diapers. You can also enter sweepstakes to win free diapers. This one, for example, gave away free diapers for a year. The National Diaper Bank Network was founded to help meet the basic needs of all children and families living in the United States by providing free diapers to local residents. Their website has a directory that lists local organizations they work with. It’s unfortunate, but one in three U.S. families can’t afford enough diapers to keep their baby clean, healthy, and dry. Huggies is a founding sponsor of this nationwide initiative, allowing low-income families to have access to free diapers. If you have trouble affording diapers, you can check here to find out if an agency in your area provides diaper assistance to families in need. You can also call or search online at 2-1-1. There may also be giveaway events sponsored by local community organizations. When my son was a baby, I heard about an event where everyone received a free case of diapers, and there were no income or residency requirements to attend or receive the diapers. These events aren’t necessarily heavily publicized, so be on the lookout for events like this in your area. Diapers are big business for manufactures. To get their product in front of people, they commonly give free samples to pediatricians’ offices to hand out. It’s similar to pharmaceutical reps giving free medicine samples to a doctor’s office – they want to grow their business. You can take advantage of this by asking your doctor if they have any free diaper samples you can have. In some cases, they may even have free formula samples, too. This may not be a long-term solution, but it can be a great way to get free diapers in a pinch. If you’re an Amazon Prime member you can create a registry on Amazon Family, just like you can with Target. The registry allows friends and family to buy items you’ve selected for your newborn child. Amazon Family is free for all Amazon Prime members. You don’t need to add anything special to your Prime membership; it’s simply an added feature. This is a great way to get free baby stuff and let friends get you the items you want. If you’re not an Amazon Prime member, you can sign up for a free 30-day trial to test it out. This option may not get you free diapers and wipes, but brand name diaper companies offer coupons on their products online so you can still score a discount. Just search for manufacturer’s coupons for your favorite brands. You can also try the old-fashioned method of clipping coupons. Manufacturers commonly offer free diaper coupons in the Sunday paper. You can also contact diaper companies and ask them for coupons. Oftentimes they will mail them to you for free. Again, this won’t result in free diapers but it can be a good way to save money. Babies can be expensive, and even more so as they grow. However, there are many savings opportunities within your grasp. Finding ways to get free diapers, and other free baby stuff, can be a great way to stretch your budget and use those savings for other needs. What are some other ways you’ve seen work to get free diapers? What have you done to save money raising a child? Why do you think many think it’s impossible to save money?